You will need Node 6+ installed on your machine. Some experience with Angular will be helpful. In this tutorial, you’ll learn how to build a chatroom with Chatkit and Angular 7. I’ll demonstrate how to add users to the chatroom and interact with members of the room. In addition, you’ll see how to keep track of the number of users that are currently online, and also how to retrieve the message history for a chatroom. Before you proceed with this tutorial, make sure you have Node.js (version 6 and above) and npm installed on your machine. You can find installation instructions here. Also note that prior experience with building Angular and Node applications is required to be able to understand how the chatroom is built. The first thing we’ll do is create the server, then we’ll set up the Angular app and tie them together. Before we do any of that though, we’re going to sign up for Chatkit in the next section. Before you can leverage Chatkit features in your application, you need to sign up for a free account. 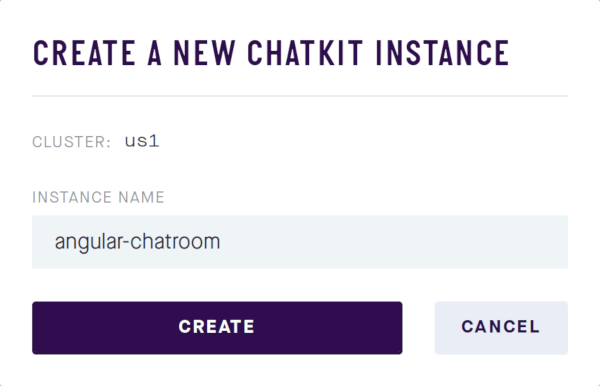 Once your account is made, you need to create a new Chatkit instance. Hit the purple CREATE button and give your instance a name as shown below. As soon as your Chatkit instance is created, you will be redirected to the dashboard for the instance. Locate the Credentials tab and take note of the Instance Locator and Secret Key as we’ll be using them on the server and in the application code. Move to the Console tab and create a new user and a new room. You can follow the instructions on this page to learn how to do so. Take note of the room ID as we’ll be using it later. As you can see, we have two routes on the server. The /users endpoint serves to add a new user to the chatroom if the username has not already been taken, while the /authenticate endpoint is used to authenticate any new chatroom users before they can gain access. Now, you can start the server by running node server.js in the terminal. You should see a message indicating that the server is set up successfully on port 5200. Once the above command finishes, the ng command will become available for you to use. You can use it to create and serve a new Angular app immediately. Within the chatroom folder, run the commands below. 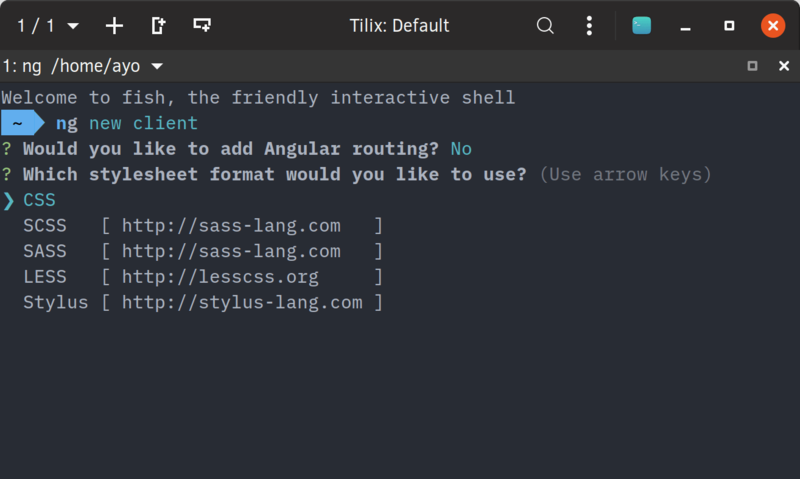 When prompted to add Angular routing, hit N, and choose CSS as the preferred stylesheet format. Navigate to http://localhost:4200 in your preferred browser. You will see the default page and some links to help you get started with Angular development. The addUser() method is triggered whenever someone tries to join the chatroom. Once the connection to Chatkit is successful, you get a currentUser object that represents the current connected user. 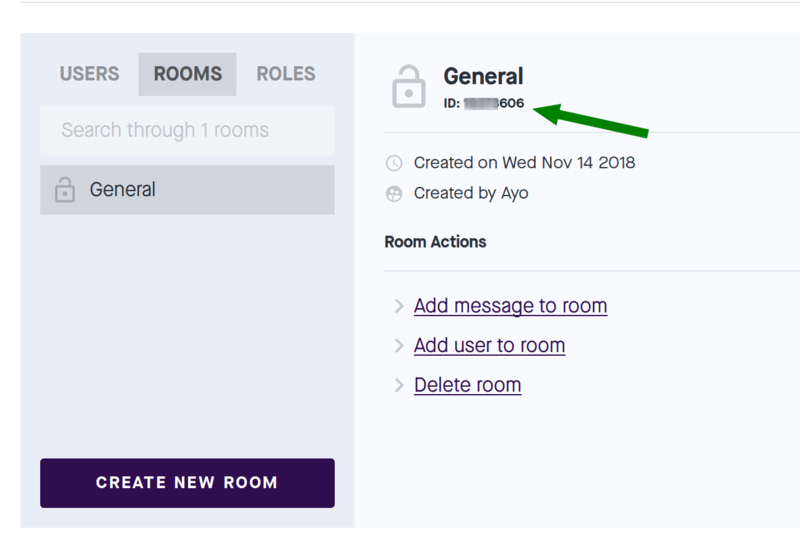 The subscribeToRoom method is then used to add the user to the chatroom, and any existing messages in the room will be displayed depending on the number you set in messageLimit. In this case, the most recent 100 messages will be shown. If you do not want any existing messages to be shown, you can set messageLimit to be 0. In the hooks object, the onMessage event is triggered when a new message is sent to the chatroom. We simply append the new message to the messages array so that the new message is displayed in the chat window. Similarly, the onPresenceChanged hook tells us when a user joins or leaves the chatroom so that the appropriate user interface updates can be made. In this case, we’re updating the users array so that the UI is updated and the appropriate status is shown for each user on the sidebar. Finally, when a message is sent by submitting the form at the bottom of the chat window, we pass the message content and room id to Chatkit in the sendMessage() method and then clear the text input by setting this.message to an empty string. This concludes my tutorial. You can checkout other things Chatkit can do by viewing its extensive documentation. Don't forget to grab the complete source code in this GitHub repository.